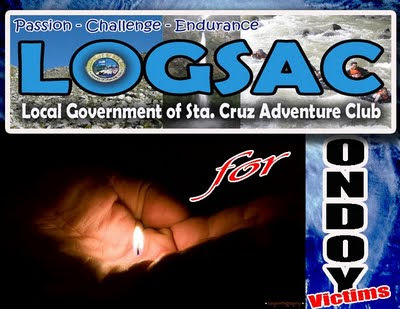 Just in time, members of LOGSAC have expressed sympathies to our brothers and sisters in Luzon by giving out relief goods for the victims of tropical storm “Ondoy” and typhoon “Pepeng”. Such assistance was channeled through the Mountaineering Federation of Southern Mindanao, an umbrella organization of all mountaineering clubs in Southern Mindanao. The club’s generosity has generated plenty of used clothing and dry foods. These might be just a pinch of what we have, but somehow it will be an expression of compassion. For a very long time, Mindanao has been a typhoon-free region, that’s why mountaineers here are fortunate to enjoy undertaking mountaineering and outdoor activities unlike Luzon. The least, therefore, that we could do to help the victims of the Luzon disaster is to share. Moreover, Ondoy and Pepeng are two great examples of how devastating it will be if nature strikes back to us. Nature might have showed so much kindness to human but I guess it already put on viewed the other side of the coin. Nature, just like any other things, has its own cruel way of dealing with human and it clearly patented in Ondoy and Pepeng. We don’t know how long the nature will stop its cruelty to us. We cannot just hope for it to stop, we cannot just stay here and continue sending relief goods to the victims. We cannot just say we are safe here in Mindanao. All things are put in their proper perspective for a reason. Ondoy and Pepeng were sent for us to be awakened. We cannot continue to take so much from the nature. It’s enough maybe that we have taken a lot. It’s now the highest time to give back what is due for the nature. Padayon pa ba inyong pagdawat ug mga relief goods hangtud karon?